“Music is formational in our values and guides what our faith is built on—the good of all and not on our own selfish desires,” said Anton Armstrong, conductor of the St. Olaf Choir. The Northfield, Minn., college’s Christmas Festival started in 1912 and expects to have more than 12,000 people turn out for performances this month. The theme for this year’s Christmas concerts at Lenoir-Rhyne University, Hickory, N.C., is “Love Came Down: A Lenoir-Rhyne Christmas” and will feature four performing groups from the school. One of the best presents at Christmas is often taken for granted—the gift of music. Unlike other churches that rely on cantors, choirs or singers to lead worship music, Lutherans are known for their robust tradition of congregational singing, especially at Christmas. This deep musical tradition dates from Martin Luther, who said singing was a form of prayer and the living voice of the gospel, and from German composers Bach and Mendelssohn, who influenced much of Lutheran worship music. “Christmas was very much on Luther’s mind,” said John Weit, ELCA program director for music. In addition to singing favorite hymns, choral music is a big part of the season for Lutherans, and several ELCA-related schools are recognized for their Christmas concerts, including Concordia College, Moorhead, Minn.; Augsburg College, Minneapolis; Luther College, Decorah, Iowa; Lenoir-Rhyne University, Hickory, N.C.; and St. Olaf College, Northfield, Minn. Several of these Lutheran schools will stream their performances, which in the past were carried on public radio. The St. Olaf Christmas Festival originated in 1912 and has garnered significant recognition nationally due to performances being simulcast in movie theaters nationwide. The festival features more than 500 student musicians who are members of five choirs and the St. Olaf Orchestra. 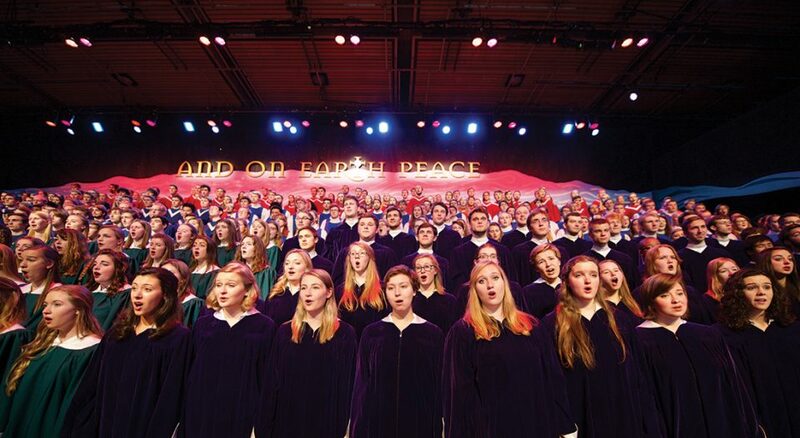 Its 2013 television special, “Christmas in Norway with the St. Olaf Choir,” even won two regional Emmy awards. This December more than 12,000 people will turn out for four Christmas Festival concerts at the school. “Just like it wouldn’t be Christmas without our favorite music from Bing Crosby, choral music is a mark of the Christmas season,” said Anton Armstrong, who has conducted the St. Olaf Choir for 27 years. Armstrong said his artistic team works on the Christmas Festival 11 ½ months per year. This year’s theme, “Light Dawns; Hope Blooms,” reflects the hope that the world needs right now, he said. This theme developed from a refrain in a piece the choir will perform, “Light Dawns on a Weary World” composed by Mack Wilberg and text by Mary Louise Bringle. Music from St. Olaf’s Christmas Festival will also reflect other strong Lutheran themes, including justice and peace, equality and care for creation. 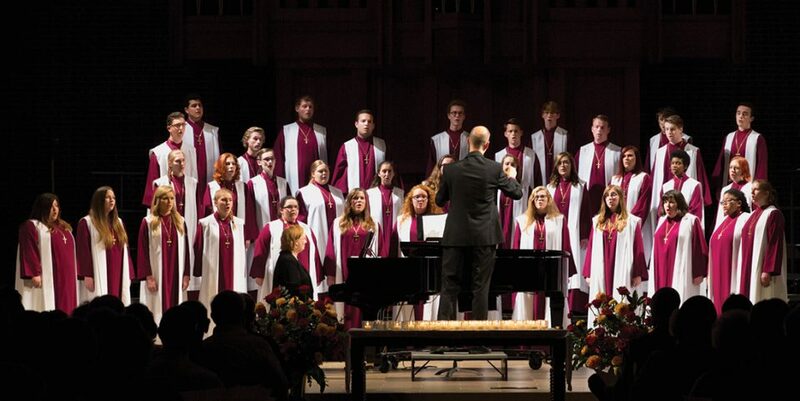 In addition to Scandinavian and German traditions, the concert includes music from around the world, Armstrong said, which reflects the worldwide concerns of St. Olaf and the ELCA. “The pieces define our Lutheran tradition and express Lutheranism at its best—care for the planet and care for each other,” he said. 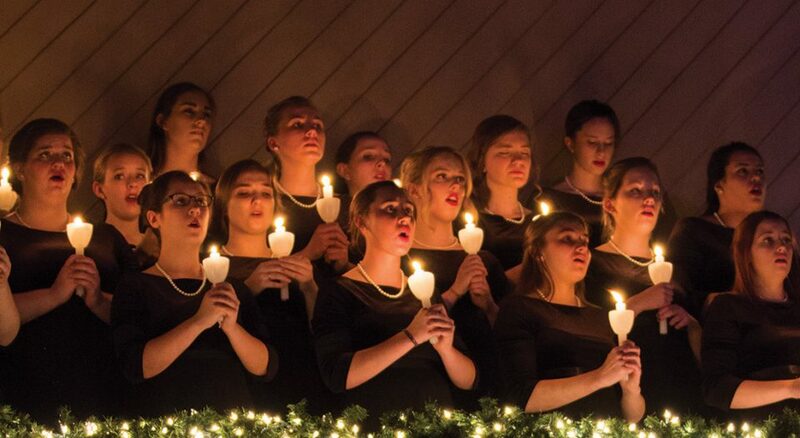 Lenoir-Rhyne is also expecting full houses for its Christmas choir concerts, and director of choral activities Ryan Luhrs thinks people’s love for the season’s music runs deep. “I think the love of Christmas music transcends many aspects of our culture,” he said. “It’s perhaps the reason some radio stations begin playing Christmas music exclusively this time of year. Doug Brandt, a New York City-based composer who has written choral Christmas works with sacred texts, believes Christmas carols resonate with people no matter their religion or background because of the universal theme of hope. “Perhaps it’s the struggle of the poor or the humble family that’s turned away from an inn and has to make do in a barn,” said Brandt, whose setting of Wendell Berry’s pastoral Christmas poem “Remembering That It Happened Once” was just published.